Income Tax Department of India has changed rules regarding quoting of PAN for specified transaction. IT Department has changed rules for 20 transactions which are taken place in india for which you need to show PAN card (or without pan card you cannot do transactions). PAN card is unique number by which your financial transactions (big transactions) are tracked by IT Department and you are taxed based on this transactions.Also, by tracking financial transactions, Government can track Black money (money which are not taxed). In case if you don't have PAN card, you need to fill particular form to mention it to IT Department (so IT Dept can know which transactions is done by). 1. Immovable property :- Earlier you need to show PAN Card for sale/purchase of Rs.5 lakh or more of immovable property but now Rs.10 lakh is new limit. Means property which costed Rs.10 lakh by Stamp Valuation authority need PAN card for sale/purchase. 2. Motor vehicle (other than two wheeler) :- PAN Card is required to buy any vehicle (more than two wheeler). 3. Money Deposit :- Earlier you need to show PAN card if you deposit Rs.50000 in one time (nationalist bank) but now even Co-operative banks,post office,Nidhi,NBFC companies also need PAN. Also, if your deposits is aggregating more than Rs.5 lac in one year, you need PAN. 4. Deposit with Post Office Savings Bank :- Earlier you need to show pan card if your deposit in Post office exceeds Rs.50000, which is now Discontinued. 5. Sale or purchase of securities :- You need PAN Card for sale/purchase of contract of Rs.1 lac. 6. Opening Bank Account :- All new accounts needed PAN card (co-operative and basic saving accounts are excluded). 7. No need of PAN for Installation of telephone/ cellphone connections. 8. Hotel/restaurant bill(s) :- If your hotel bills exceeds Rs.50000 than you need PAN Card (earlier it was Rs.25000). 9. Cash purchase of bank drafts/ pay orders/ banker's cheques :- More than 50000 of amount is purchased than PAN card is needed. 10. PAN needed for Cash deposit with banking company of More than Rs.50000 in one day. 11. Foreign travel :- If your Foreign travel bill (including fare, travel agent fees, forex purchase) exceeds Rs.50000 than you need PAN (earlier it was Rs.25000 limit). 12. Credit Card :- PAN card is needed to buy credit cards from Banks, Co-operative banks also included. 13. Mutual fund :- PAN needed to buy Rs.50000 or more of Mutual funds. 14. Shares of company :- To open demat account you need PAN now, also purchase/sale of Rs.1 lac and above of shares, you need PAN (earlier for Rs.50000 you need PAN). 15. Debentures/ bonds :- PAN needed for transactions exceeds Rs.50000 of Debentures/ bonds. 16. RBI Bonds :- Payment of Rs.50,000/- or more to RBI for acquiring its bonds. 17. Life insurance premium :- Payment of Rs.50,000/- or more to Life insurance premium is under PAN. 18. Purchase of jewellery/bullion and Goods/Service :- Earlier no PAN required for this category but now if you buy Jewellery/bullion and good/service of Rs.2 lac(per transaction) you need PAN. 19. Cash Payment :- More than Rs.50000 of Cash payment in one year is required PAN. Apart from this, you should always fill income tax return and enjoy no issue from Income Tax Department. 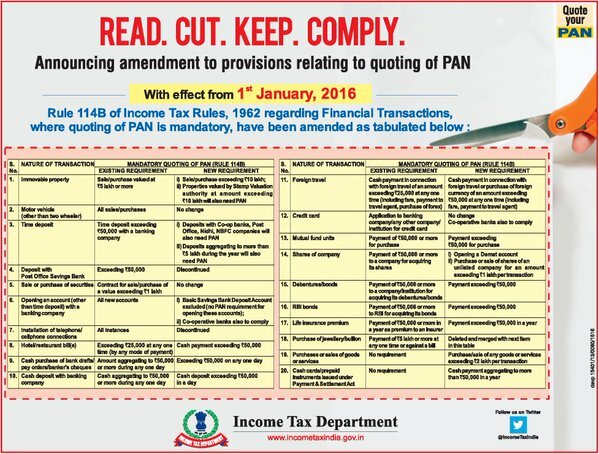 This new changes will be applicable from 1st January, 2016. If you have any question regarding this, you can ask us on below comment box.